Short Discription: Al Qura'n with 6+ Famous Reciters and 40+ Translation and 2 Arabic Tafsir of Qura'n Verse by Verse synchronized audio Telawah (Recitation). Uthmanic Script Style for Arabic and customization text color and sizes. All Reciters Audio Downloadable after installation. Work Online and offline as well (only those surah will work offline that user loaded while internet connected). 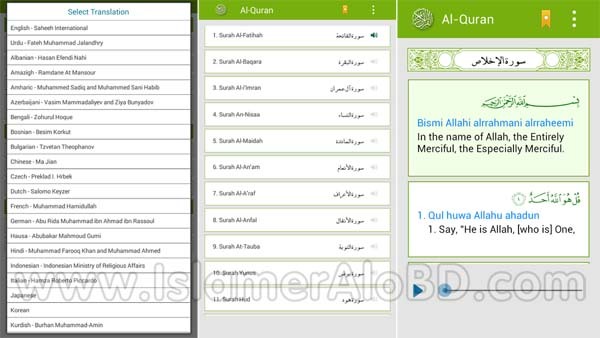 Short Description: With this apps you can Read the holy Qura'n in Arabic & English Translation. U can Also Listen The Audio Recitation using your Internet Connection. ALHAMDULILLAH.U DONE A GOOD JOB FOR US. It's a great Islamic site and informative also.